On behalf of the University of Hawai‘i at Hilo Office of Applied Learning Experiences (ALEX), I’d like to invite you to create an internship within your office, department or college. Not only would you be helping to develop a university student, but also improving the productivity of your office, department or college. For example, imagine how a marketing student who has learned how to create a marketing plan and optimize the use of social media could help to increase the rate of student involvement in programs that target undergraduate students or how an environmental studies student who has learned how to conduct energy audits could help to reduce the amount of energy consumed on campus. 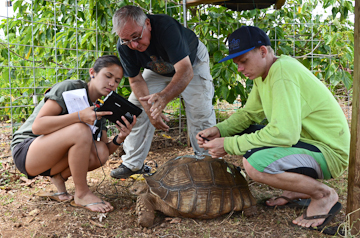 Interns work on a tortoise project under support from the Pacific Internship Programs for Exploring Science program at UH Hilo. Marie McKenzie (left), is a geography major, and Ron O’Brien (right), is an agriculture major. James Juvik, professor of geography, is a co-adviser on the project. An academic internship is a form of experiential education that integrates knowledge and theory learned in the classroom with practical application and skill development in a professional setting. 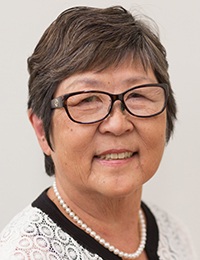 Students can possibly earn academic credit and the work/learning arrangement is overseen by a faculty or staff member from the University of Hawai‘i at Hilo and by a designated employee of an organization, office, department or college. The internship is usually the length or equivalent of an academic term, may be part-time or full-time, paid or unpaid. An integral component of the experience that distinguishes it from other types of work is one or more forms of structured and deliberate reflections contained within learning agendas or objectives. What criteria does our office, department or college need to meet? The experience must be an extension of the classroom: a learning experience that provides for applying the knowledge gained in the classroom. It must not be simply to advance the operations of the host organization or be the work that a regular employee would routinely perform. The experience has a defined beginning and end, an internship description as well as learning outcomes. There are clearly defined and measurable learning objectives/goals related to the student’s goals and program of study. There is supervision and mentoring by a professional with expertise and educational and/or professional background in the field of the experience. There is routine feedback by the experienced supervisor/mentor. There are resources, equipment, and facilities provided by the host agency that support learning objectives/goals. You’ll have the opportunity to discuss your internship opportunity/opportunities and identify candidates at UH Hilo’s first dedicated internship fair, which will be held on Thursday, November 15, from 4:00 – 8:00 p.m. Participants are required to attend a mandatory information session from 4:00 – 5:00 p.m. and the fair will be open to students from 6:00 – 8:00 p.m.
What makes this fair different from past UH Hilo Job and Internship Fairs? Dedicated Solely To Internships: It’s the first UH Hilo career fair dedicated solely to internships. Students Will Be Well Prepared: Most students will have researched the position you are offering prior to the fair (internship postings will be provided online) and participated in pre-fair workshops on resume writing and interviewing skills (while also earning a professional development certificate). In addition, professional attire and a resume are required for entry into the fair. More Student Participants: Students of most majors and degree programs will participate in the fair. The fair will also be held in the evening, when most students are available. Pre-fair Information Session: An information session prior to the fair (4:00 – 5:00 p.m.) will help you to understand what is expected of both your office, department or college and your student intern before and during the internship process. The workshop will be followed by a dinner and networking session. If you and your office, department or college are interested in participating in the internship fair, please complete the registration form at the following link: http://goo.gl/buxge Registrants will be provided with information designed to prepare them for the Fair and the internship process prior to attending the Fair. Deadline for registration is November 1, 2012 and there is no charge for participation. Please feel free to contact me should you have any further questions about the fair or creating internships within your office, department or college.